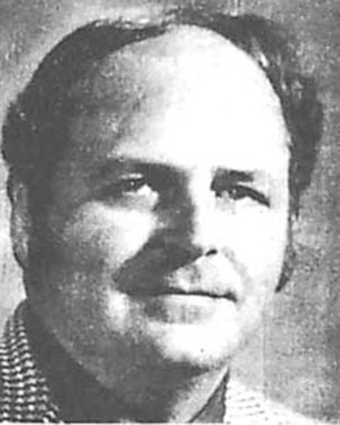 Richard Auger, proprietor of the Morin-Auger Agency, Sanford, Me., was recently named Realtor of the Year for 1973 in York County. A licensed broker since 1962, Auger limited his work to the Saco area primarily until late 1967. At that time he went up to Sanford to look for apartment buildings for possible investment. He consulted Emil Morin, head of the Morin Real Estate and Insurance Agency, about the investment. Morin responded that if he wanted to make an investment, why not buy this business. Although taken by surprise, Auger saw a golden opportunity to expand his horizons and plucked the agency off the market in Jan., 1968. At that time, the Morin agency had developed a sizeable insurance business, but was not as big in real estate. Since Auger has taken over, however, the trend has reversed itself and real estate and appraising now dominates. Likewise, the staff has increased from one broker to four, not including two secretaries. Activity has been so brisk, in fact, that Auger is currently contemplating a coastal area office in the near future. The same year he purchased the Morin Agency, Auger became a Realtor, joining the York County board, the Maine and the national Realtor Associations. In the ensuing years, he has served as York County board president, earned his Realtor of the Year distinction and on the board of directors. Real estate, however, did not always have such an allure to the Biddeford native. In fact, while attending the Univ. of Me. He enrolled in the real estate law course for the sake of knowledge and nothing else. That course piqued his curiosity to the point that he quit his job and began selling real estate full time. Auger firmly believes his job as a Realtor is to represent other people. He does not get involved in other projects except as a Realtor. He and Don Turner specialize in commercial property listings. In that field, Morin-Auger has brought McDonald’s, Drummer Boy and the Portland Glass Co. into the Sanford area. Auger said his agency specializes in exclusive listings such as the Mountain View subdivision of 24 homes, which is being developed by Henry Milne and Thomas Dumont in Waterboro. Almost concurrently with his moving into the Sanford area, the town began a major downtown urban renewal project that has spurred the area’s growth. Auger has been instrumental in developing the town’s 240-acre industrial park, which adjoins the airport. As a member of the board of directors of the Industrial Development Commission he was involved in the purchase of the land when the mills moved out of the area and in the $300,000 investment to put in more roads to the area, which he admitted is geographically off the beaten path. Auger is as busy away from the office. He is a charter trustee of the Human Services Institute of Me., which was just formed. He is also a charter member of the Saco Credit Union and a member of the Notre Dame Federal Credit Union. He is also president of the Notre Dame School Board. He is a member of the Sanford Springvale Rotary and the Sanford Elks and the Knights of Columbus.